Apparently, Catholics aren't into giant robot smackdowns, which is ... fine. 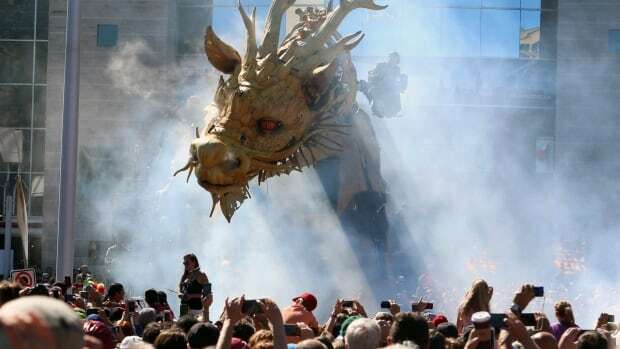 Canada turned 150 this week, and to celebrate, a robotics, puppetry, and live performance company called La Machine unleashed its giant robot monsters on downtown Ottawa. It didn’t go over well with everyone. One of the monsters, a gigantic spider named Kumo, enjoyed his perch on top of Ottawa’s Notre Dame Cathedral, where he could presumably see most of the city below with his eight robotic eyes. Canadian Catholics were deeply disturbed to see Kumo looming over them this week, and on Tuesday, Archbishop Terrence Prendergast had to apologize to his congregation. Archbishop Prendergast admitted to a Canadian Catholic blog that he was truly surprised local Catholics hated Kumo so much. “My cathedral staff and I anticipated that some […] might object, but thought it would be minimal, as nothing demeaning was intended in the spider being near the church,” he told CCN in an email. I'm not even Catholic and that's straight up horrifying. To be fair, Kumo isn’t just a big spider statue (though that may have been scary enough). At 40 tons, and with the ability to spray water at his enemies, Kumo “awakened” from his monstrous slumber atop Notre Dame, called to the world by the cathedral’s ominous organ. Long Ma rears his monstrous head when he hears Kumo climbing down the cathedral. On the archbishop’s Facebook wall, one woman wrote, “I don’t understand how allowing a mechanical spider to stand on the cathedral is anything but disturbing, disappointing and even shameful,” apparently believing that either spiders or robots are inherently evil. Making a sad note, Archbishop Prendergast said simply that he thought people would see it as a sign that the Catholic church was trying to be fun. “I guess we thought people would see this as a sign the church is involved in Ottawa’s celebrations,” probably sitting forlornly in the church and watching Kumo’s performance on YouTube. You can follow La Machine’s urban performances on their website and go to Archbishop Prendergast’s Facebook page to assure him that robots are definitely cool, and he’s not a loser.